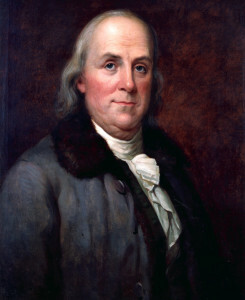 Franklin earned national and international fame as a printer, publisher, author, inventor, scientist, diplomat, and charming wit. Self-educated, he had a tremendous breadth of knowledge and achievements. He was celebrated as a font of homely wisdom with his enormously popular Poor Richard’s Almanacs; he was a driving force behind the American Revolution; he was a diplomat of extraordinary skill, instrumental in negotiating the Franco- American alliance during the revolution; he was an entrepreneurial innovator (a pioneer of the insurance industry); he was a brilliant author; he was an internationally respected scientist (especially for his early work on electricity); and he was an inventor. Bifocals, the Franklin stove, and the lightning rod were among his best-known inventions, but his greatest invention was himself. In his justly celebrated Autobiography, Franklin mythologized his own life, presenting himself as an illustration of all that was possible in America for one who applied wit, sound ethics, imagination, and a willingness to work.